Exclusive photos from Karolyn Grimes' film career! 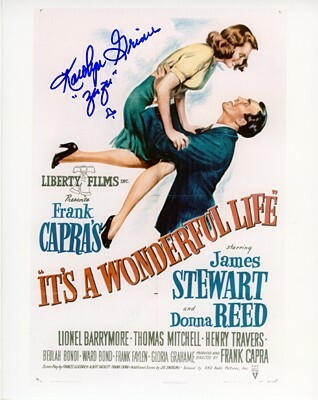 All are personally autographed by Karolyn Grimes. Photos are 8"x10" and $25 each unless otherwise noted. Click on the pictures to see enlargements. Click on the button to purchase. You can change quantities on the shopping cart page. For detailed information on payment options and how to place your order, see our Ordering Information page. Enjoy! Different photo of the Bailey family. This photo advertises the film and is quite colorful. This would be a great addition to your collection. 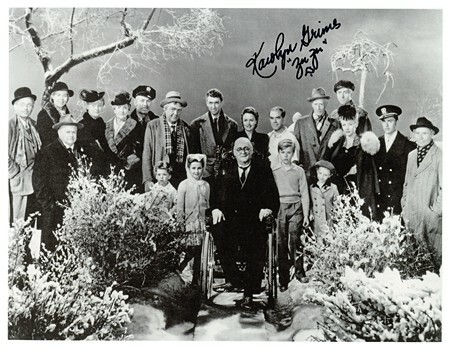 This 8 x 10 photo is a great shot of the Bailey family. It would be a great addition to your Christmas time celebrations as well as a wonderful item for the collector. 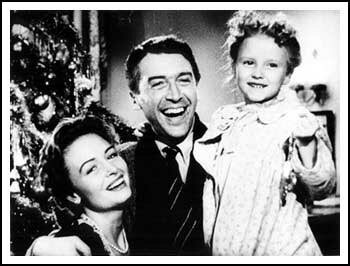 This is an 8 x 10 glossy photo of the famous "bell rings..." scene in the movie with Karolyn, Jimmy, and Donna. 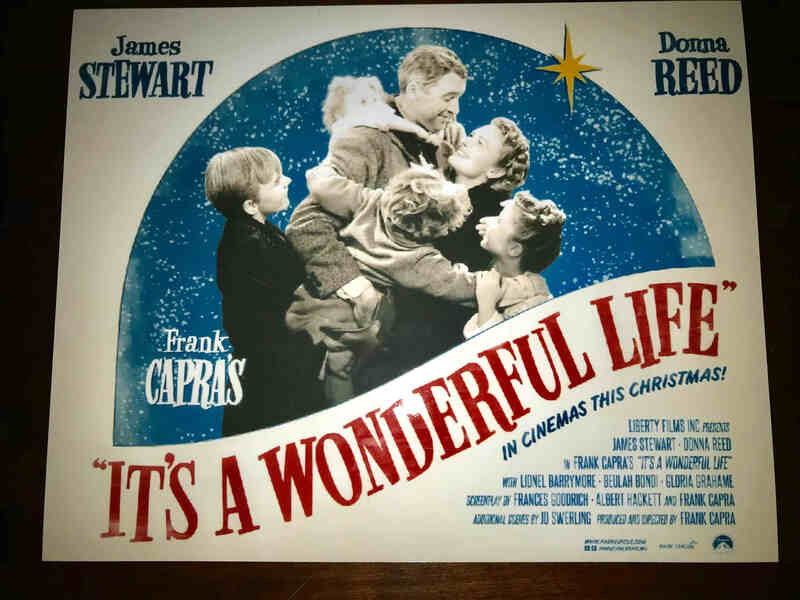 This is an 8 X 10 glossy photo of one of the posters that was placed in the windows of the theaters when the film was released in 1946. 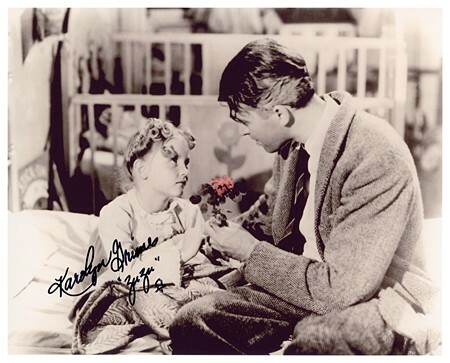 Another photo of the tender scene with Karolyn and Jimmy alone, holding the rose. Zuzu says, "Paste it, daddy!" This NEW photo was designed especially for Karolyn and she liked it so much that she had it copied and is offering it to her fans. It is a reminder of the tender moment when she asks her Daddy to fix her rose after some of the petals have fallen off. She wants him to paste them back on. The 8 X 10 glossy is sepia toned and there is a splash of a muted red for the petals.In the background you can see a rose that was apparently on a part of the bed next to her. 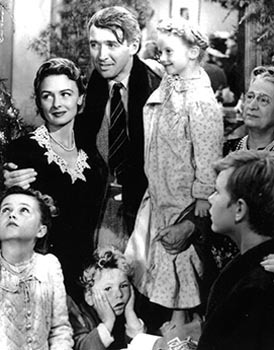 Clarence is watching over the Bailey family during the emotional moments of the final scene of the movie. George has just uttered those words, "Attaboy, Clarence." There is a tiny splash of color on the tree. This is a rare photo only available through Karolyn. 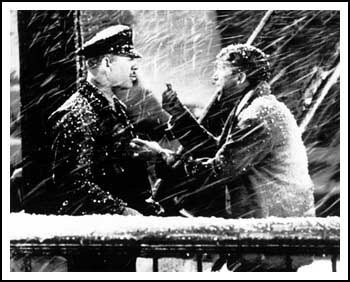 This photo shows the scene in which a jubilant George exclaims to Bert the Cop, "Zuzu's Petals!" 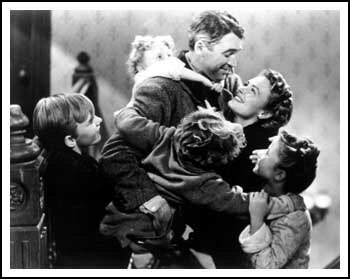 A cute picture of Karolyn hanging onto Jimmy's back, with the rest of his family hugging him. The entire Bailey family - a great photo for remembering Jimmy, Donna, Karolyn and all the kids. 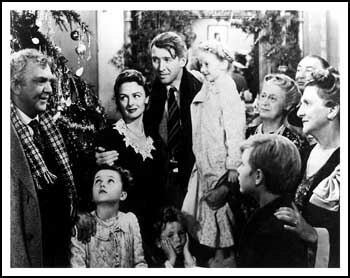 A classic scene from the movie. 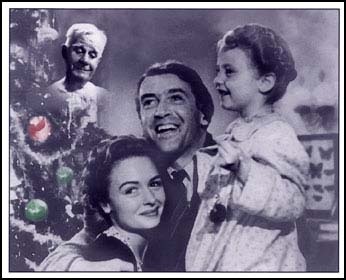 Mary, George and Zuzu Bailey (Donna Reed, Jimmy Stewart, Karolyn Grimes) are triumphant in the film's final scene. 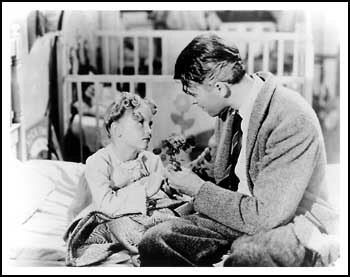 Tender scene with Karolyn and Jimmy alone, holding the rose. 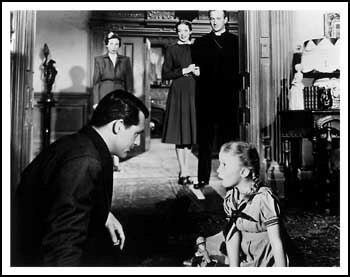 Karolyn and Cary Grant in a scene from the movie. 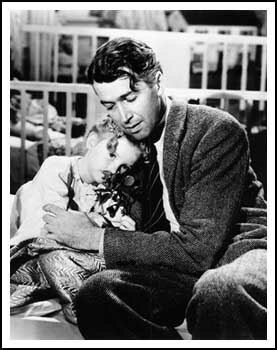 They got along as well off-screen, with Cary playing games and telling stories to Karolyn between scenes. 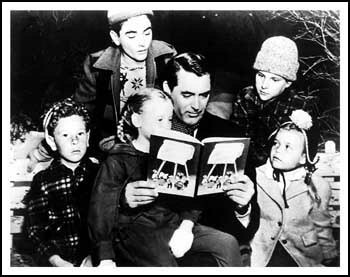 This unusual promotional photo from The Bishop's Wife pressbook shows Cary Grant, Karolyn and other children from the film's snowball-throwing scene proing over a just-released children's book. This is a publicity photo that was taken for the movie. 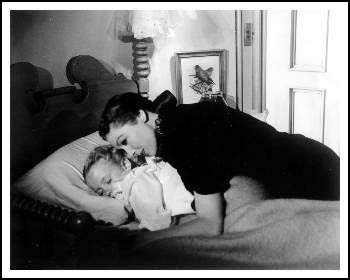 Loretta Young is shown in a touching moment as she tucks "little Debby" (Karolyn) in bed for the night. 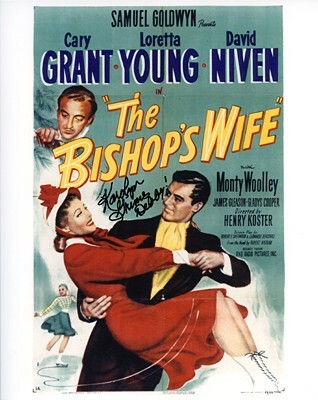 This is a photo of one of the lobby cards used to advertise the movie "The Bishop's Wife. 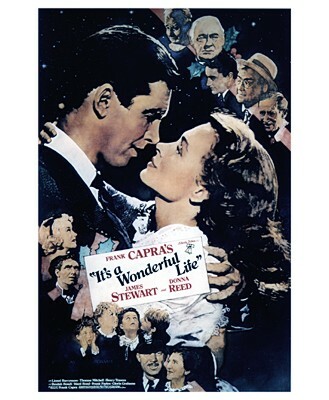 "The colors in the photo are especially vibrant and remind us of the romance and comedy of this classic film. 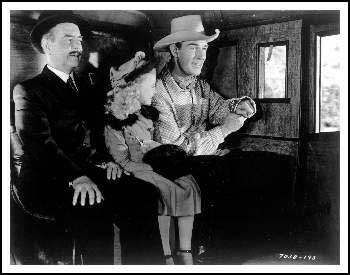 Randolph Scott is entertaining little "Myrtle" (Karolyn) as they travel in a stagecoach. She is traveling alone to return home to be with her father. 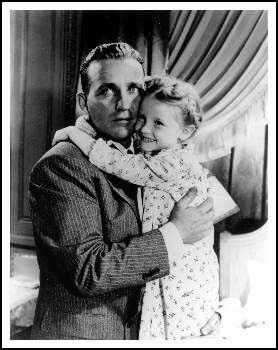 Karolyn, as "Mary Elizabeth" and her movie father Bing Crosby are getting to know each other in this tender scene from the movie. Glenn Ford plays a mean-spirited man searching for the Lost Dutchman's Gold Mine. 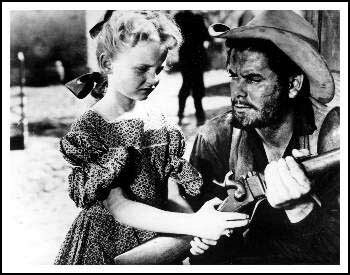 He scares "Martha" (Karolyn) by showing her how to shoot a gun in this scene from the movie. 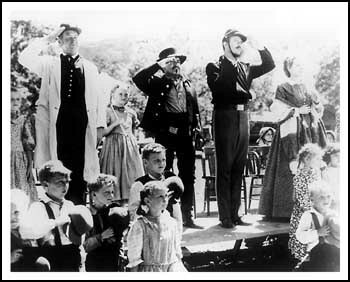 Karolyn with John Wayne and other cast members in the John Ford western - one of Karolyn's last movie roles.